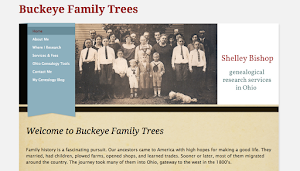 The summer weekends of my childhood revolved around Buckeye Lake, a small lake east of Columbus, Ohio, that seemed like a world away. My Grandma and Grandpa, Nora and Lloyd Ballenger, had a cottage there, and the whole family—aunts, uncles, cousins—would go out every Saturday and stay together. I remember many a Saturday evening lying on the floor of the cottage watching The Lawrence Welk Show, My Three Sons, Get Smart, and my favorite, Petticoat Junction, on the big console TV. One of the highlights of each weekend was going for a boat ride. Grandpa had a gleaming Chris-Craft Continental that he kept hoisted at the dock, which we called simply “the Chris Craft” (no fancy name on the stern for us). 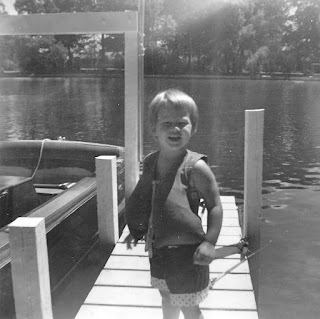 I loved standing on the dock with my life jacket on, watching the boat being lowered into the water. It fascinated and terrified me at the same time. As Grandpa turned the ignition, the engine would roar to life with a spew of exhaust, settling into a loud chug-chug-chug-chug. And Grandpa didn’t like to waste time or gas. Once the boat was running, he wanted everyone aboard that was going aboard, now. The boat was deep and, for a child’s legs, hard to get into. A side windshield prevented me from climbing into the front seat, so I either had to be lifted in or gather my courage and jump onto the rear seat. Once safely in, I could feel the big, trembling motor, which was enclosed under a covered case in the center of the boat. 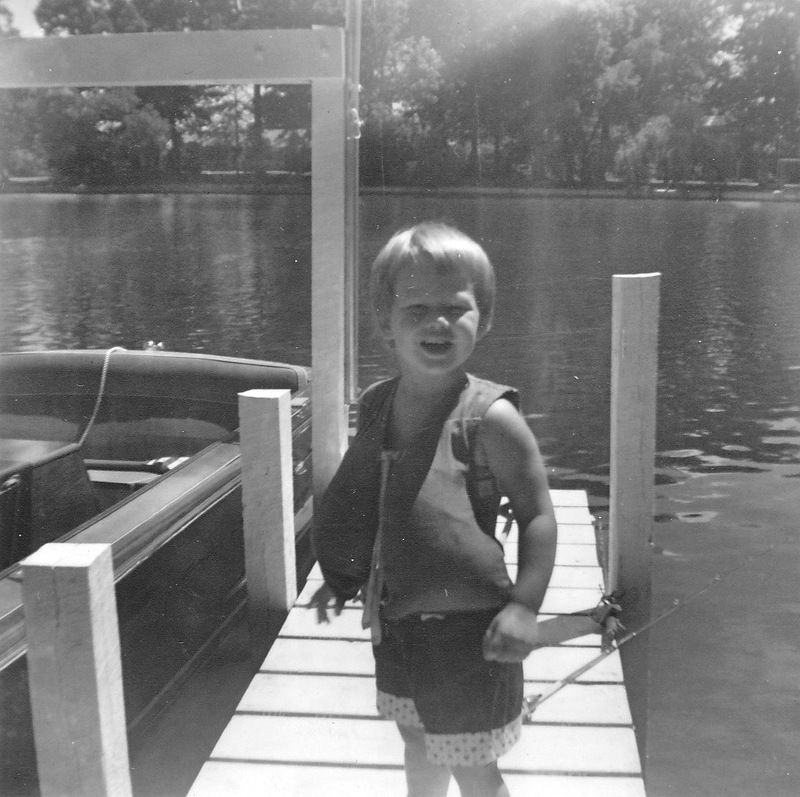 I usually perched on top of the case as we backed out of the dock. From there, I could see everything. My favorite time on the boat was the first part of the ride, as we puttered through Maple Bay at slow speed. I had a plastic boat on a string, and sometimes I’d put it in the water and watch it trail behind me, riding alongside the big boat. Grandma was always afraid I’d lean out too far and fall in. But it wasn’t falling in that I was afraid of—it was going fast. 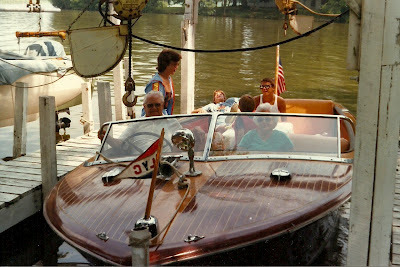 Once we left the safety of the harbor and passed the No Wake buoy, I knew Grandpa would give her full throttle. I pulled my toy boat safely inside and looked for a more secure place to sit. When it sped up, the bow of the Chris-Craft raised high out of the water, while the stern seemed to sink. It took each wave with a hard thump! and a downward lurch. I remember being told I should sit in the back where it was smoothest, but I didn’t like it there. It felt too open and too low. Instead I’d push forward, through a little gap and onto the front seat, which usually held three people. They’d shift over to make room. The two front lines of the boat, used to tie it up at the dock, draped over the front windshield like reins from a horse. And that’s exactly what I’d do: hold onto those lines for dear life, pretending I was riding a galloping horse (not that I’d actually been on a galloping horse, but I’d watched my share of Bonanza). Having something to hold onto helped, but I was always relieved when we slowed to idle speed again. Of course when I got older I wasn’t scared any longer. Then it was fun to sit in the stern (it really was smoother back there) and stick my arm out as far as it would go to catch the waves on a hot summer day. The Chris-Craft had an impressive wake and threw a lot of spray to each side. As the water hit my arm, it splashed over everyone nearby. My brother was even better at soaking us than I was. Grandma was still afraid we’d fall out. We only had a few destinations on the lake, primarily the Buckeye Lake Yacht Club, Sayre Brothers Marina, and the gas docks at Millersport, where we’d hop off and run into Weldon’s Ice Cream Factory. That was a real treat. Sometimes we’d take the boat to go see friends of Grandma and Grandpa’s, but a lot of times we’d just cruise around, poking into some of the old canals and cutting through masses of green lilypads. When the lake was smooth and the Chris-Craft planed out, she could zip down to Thornville in no time. Learning to ski behind her took every ounce of determination I had, though. There was no swim platform in back, just the slippery teak hull that I had to thrust myself off of, with only a skinny foam life belt between me and that churning lake. First one wooden ski on, then the other, clutching the ski rope tightly as I assumed the position for take-off. 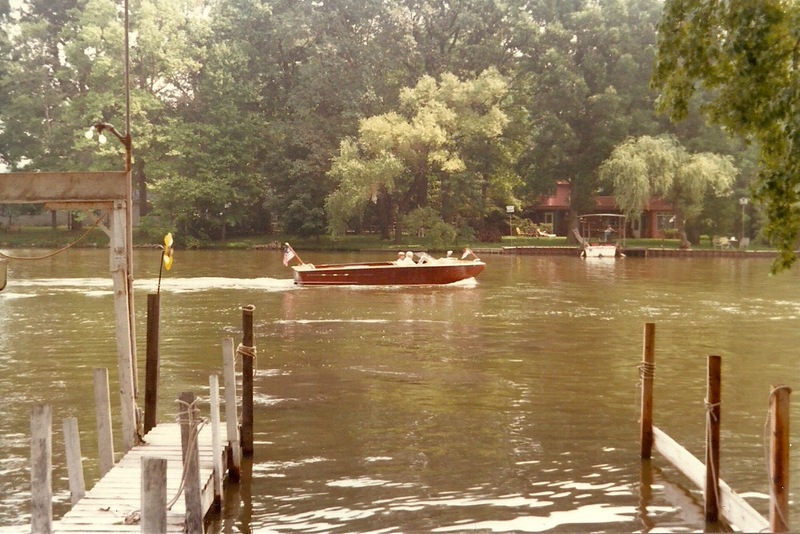 The boat had so much momentum that even when it wasn’t in gear, it would still drag me along slowly, my skis out of whack, until Grandpa or Dad gave it the gas and it roared to life. Then up, up I’d will myself, only to pitch forward or be hit broadside by a wave. My nose full of water, I’d hastily raise one ski high in the air to avoid being run over by other speeding Sunday afternoon boaters. The Chris-Craft would circle around, almost swamping me with its wake, and we’d begin again, until finally I’d make it up, victorious. 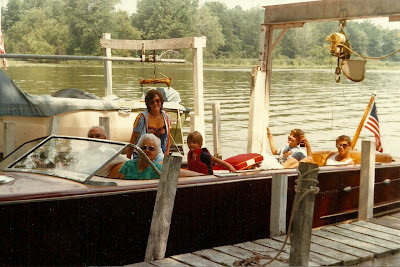 Eventually my parents bought their own boat, and my trips in the Chris-Craft grew less frequent. It was still fun to gather everyone on board and head out for a ride, but whole weekends would go by without Grandpa uncovering it. Wooden boats require a lot of maintenance as they age, and I guess it got to be too much for him. He sold the Chris-Craft around the time I graduated from college, and never bought another boat. But to be honest, it wouldn’t have been the same even if he had. That boat and I grew up together, like summer pals, and somehow it seems fitting that we went our separate ways at childhood’s close. But what sweet memories we share. What fun to hear about your fun on the boat!! 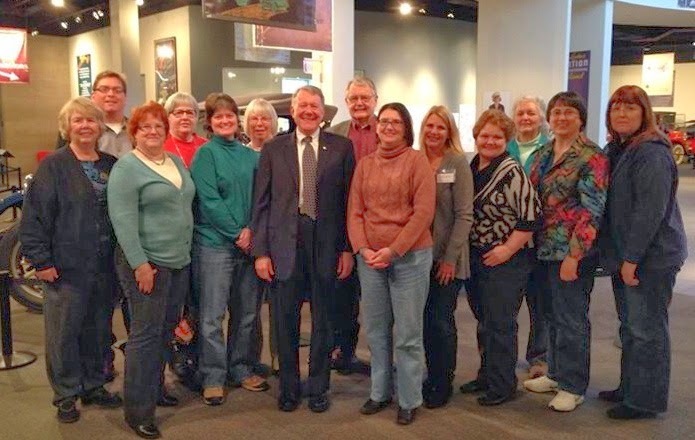 Thanks, Dorene--I had fun writing about it! I come from a boating family, too. I know Chris Craft boats are in a whole different class from the ones we used. What an idyllic childhood! I hope when my daughter thinks back she'll have fond memories of weekends aboard our sailboat up at Cowan Lake and Rocky Fork. They're part of my fondest memories. I loved riding along with you in this post. I bet your daughter will have great memories of family times on your sailboat, Kathy. There's something about the sense of being away together, with the sun and the water, that makes days like that so special. Glad to have brought back some of those memories for you. I love the way that you write--I can envision it all. Thanks for sharing your sweet memories. Aw, thanks, that really means a lot to me. Thank you for reading!